It's August 1954: we are in the Pointe Courte neighborhood of Sète, in the South of France. In the dazzling summer light, Silvia Monfort and Philippe Noiret explore their fragile love, surrounding by struggling fishermen, bustling women, children at play and roaming cats. 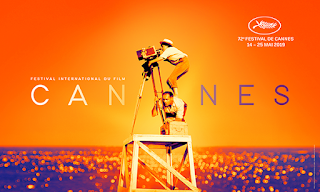 Natural settings, lightweight camera, shoestring budget: with La Ponte Courte (presented in Cannes, in a screening on the rue d'Antibes, in 1955) the photographer from Jean Vilar's Théâtre National Populaire is paving the way for a young cinema, of which she will remain the only female director. 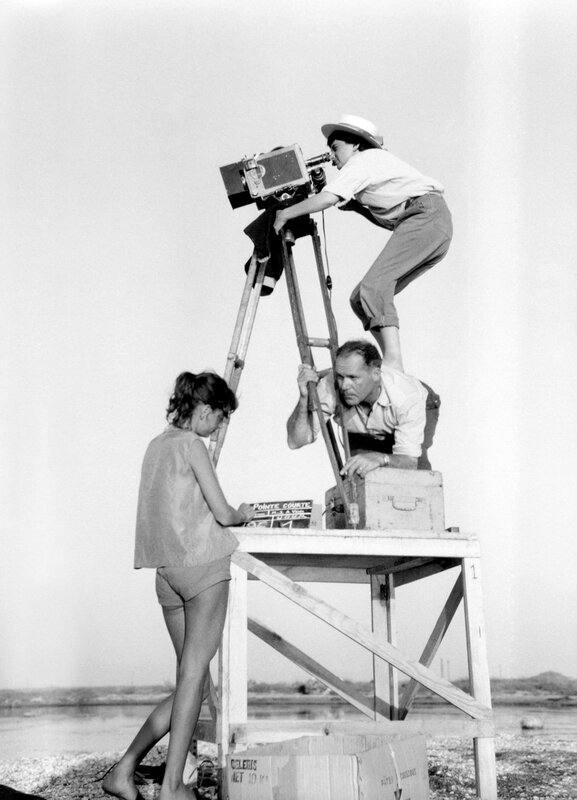 As she liked to point out, Agnès Varda is not a woman filmmaker: Agnès Varda is a filmmaker. She often attended the Festival de Cannes to present her films: 13 times in the Official Selection. 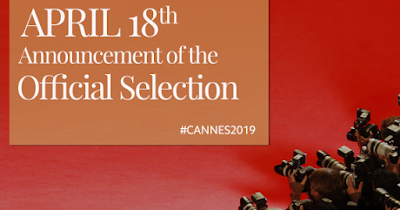 She was also a Jury member in 2005 as well as President of the Caméra d'Or Jury in 2013. When she received the Honorary Palme d'or, in 2015, she evoked "resilience and endurance, more than honor" and dedicated it "to all the brave and inventive filmmakers, those who create original cinema, whether it's fiction or documentary, who are not in the limelight, but who carry on". Avant-garde but popular, intimate yet universal, her films led the way. 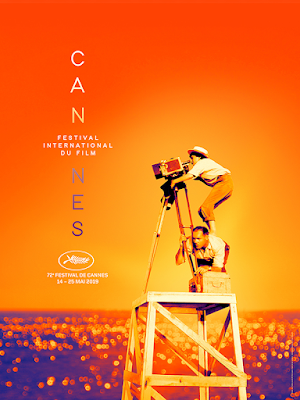 And so, perched high on this pyramid, surveying the beat at Cannes, young and eternal, Agnès Varda will be the inspirational guiding light of this 72nd edition of the Festival! As you can see in above photo, the girl working on a clapperboard was taken out of the poster composition, which makes final design a lot more intersting, even when now we know man is looking at girl and nothing else (lol). 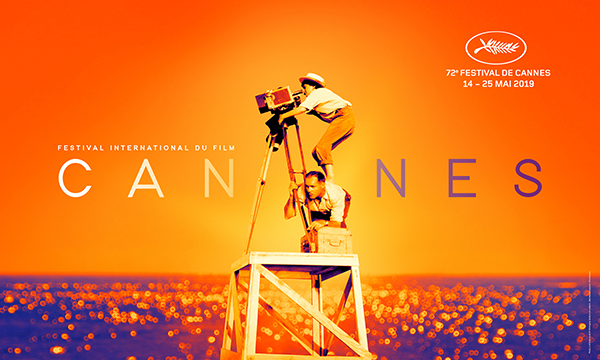 I'm glad Festival de Cannes is celebrating Agnès Varda life and work, especially when they chose a photo from a film that many critics claim "invented" the New French Wave. As part of my celebration I invite you all to read an article by Ginette Vincedeau from January 22, 2008 in the Criterion site that's here. Enjoy! Unfortunately when we take a look at the signatures we notice how improvised was the change of poster due to Varda's passing away as signatures have nothing to do with poster design and when seen together, they look sad, colorless, cold. 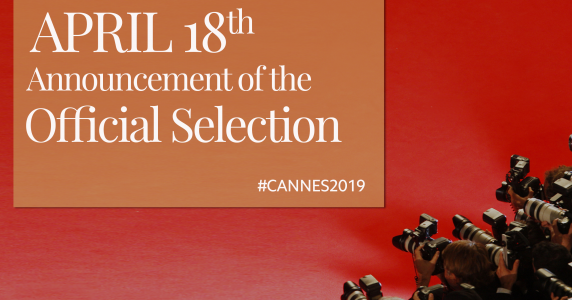 The announcement of the 2019 Official Selection by Pierre Lescure, President of the Festival de Cannes and Thierry Frémaux, General Delegate, will be live on Thursday April 18, from 11am on Youtube, Dailymotion, Facebook, Twitter, and the Festival's official website.